Mountain brook flowing through the land. The property is in a rural, country setting one mile from Moretown Village and a short drive to job centers, skiing and shopping. Homes near the land are dispersed and generally well maintained, creating an attractive rural character. The village hosts the elementary school, a well-appointed country store and town offices. The adjacent towns to the north and south, Waterbury and Waitsfield (each 10 miles from the property), offer diverse job markets, a variety of retail stores and specialty restaurants. Multiple skiing venues are also nearby, including Mad River Glenn, just 11 miles from the land. The regional high school is 3.5 miles to the west. Burlington, Vermont’s largest city, and the Stowe Mountain Ski Resort are both a 45-minute drive to the west and north respectively. Boston is about a 3-hour drive to the southeast. 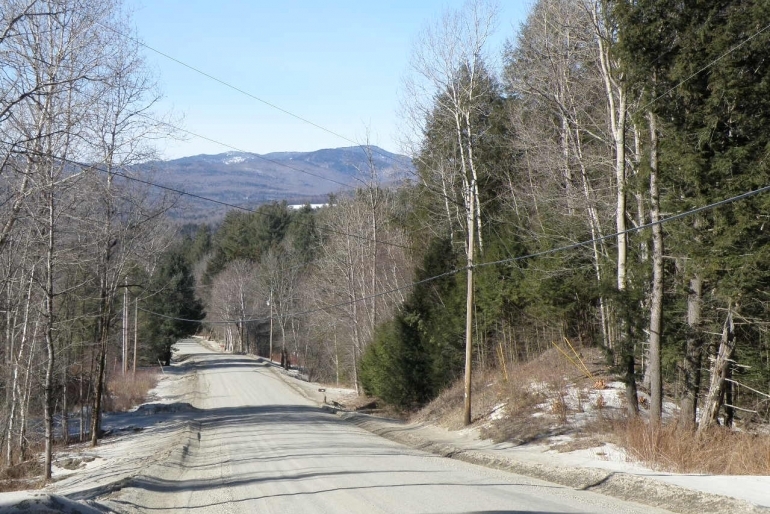 Access is provided by direct frontage along Moretown Mountain Road, a gravel, town-maintained road that runs from Moretown Village to the Town of Northfield, home of Norwich University, 8 miles to the east. On its way to Northfield, and just beyond the property, the road passes over Moretown Gap, a relatively high elevation point which accentuates the sweeping views of the nearby Green Mountain Range in this part of Moretown. The land benefits from two points of frontage: the western area has 603’ of frontage and an established driveway and clearing; the eastern frontage is 382’ and offers a potential driveway cut into the property’s high ground. Internal trails are well developed and easy to walk. The property’s terrain is mostly gently sloped, creating western exposure with soils that are predominately well-drained and productive. Three streams run through the land. 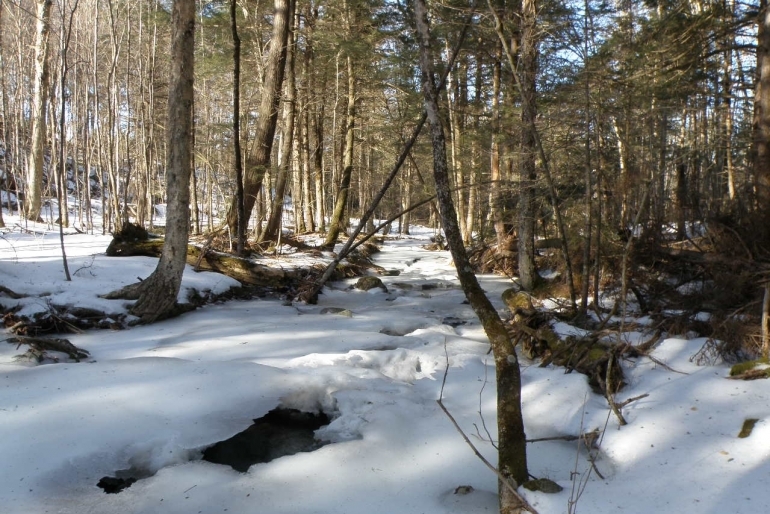 One is a year-round brook at the southern end, which is lined with dense hemlocks. A smaller brook bisects the forest, while the third brook runs along the land’s northern end. The high point on the forest (1,200’ above sea level [ASL]) is at the property’s eastern end, not far from the road frontage. From this point, terrain gradually slopes westerly to a low elevation of 900’ where the mountain brook leaves the property. 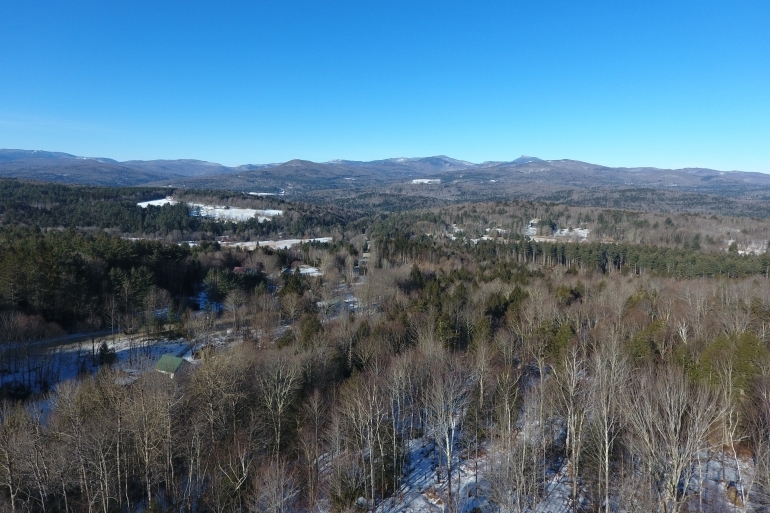 While nice views are possible from most areas of the forest, the highest elevation near the eastern road frontage offers the best views, and is the most easily accessible when considering driveway construction. 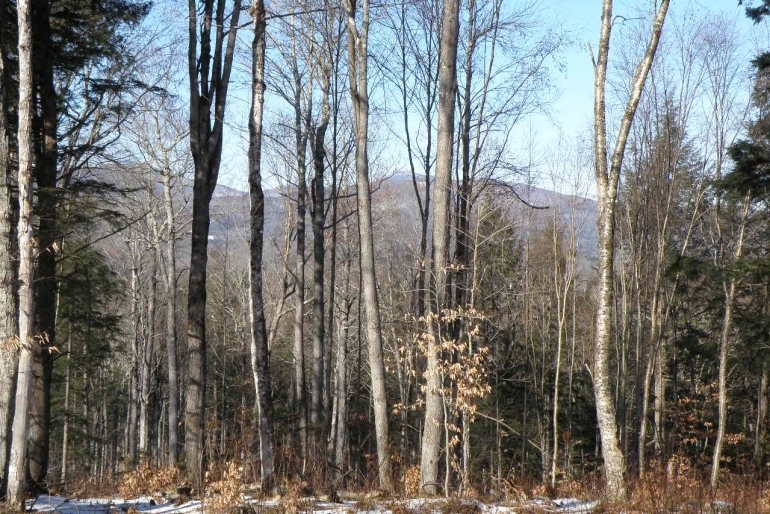 The potential house site in this area provides attractive local views of nearby forestland with an occasional distant home. 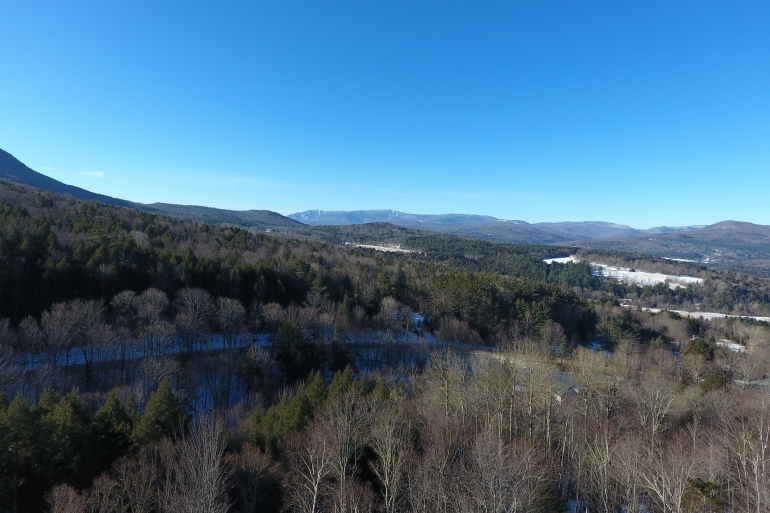 The view also includes a panoramic view of the Green Mountain Range that extends from Mt. Abraham at Sugarbush Ski Resort to Camels Hump and beyond to the north. The opposite end of the property to the east holds more level terrain with good options for conversion to meadows in many areas. 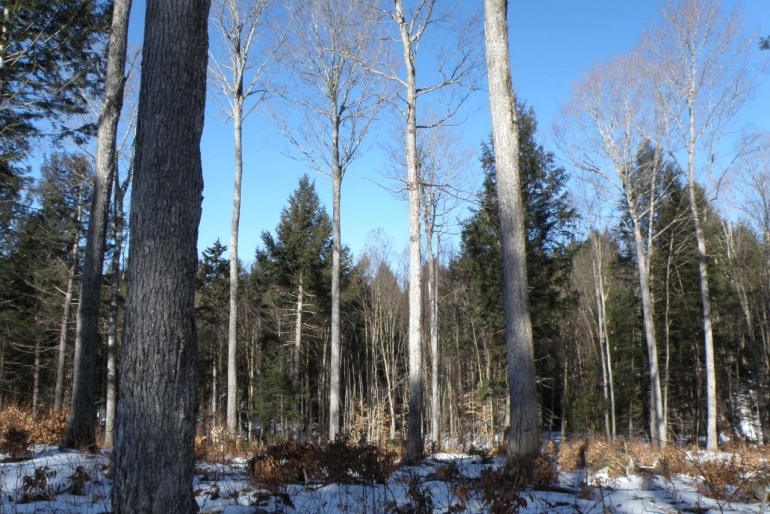 The forest was thinned in 2014 using a classic silvicultural “shelterwood” treatment whereby the lower ground stems were removed and thinning occurring in the overstory with the highest quality stems retained. This treatment creates open ground conditions allowing long visibility within the forest and easy walking. 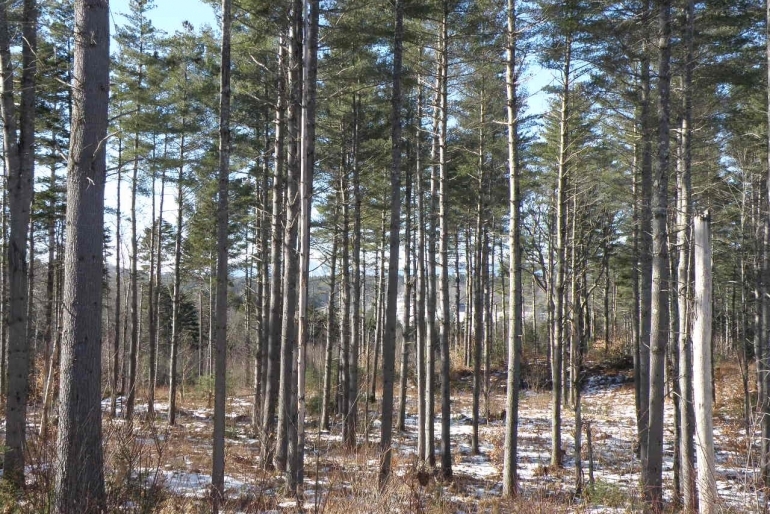 Of particular interest is the thinned white pine stand at the western end of the property which boasts “park-like” aesthetics. The sugar maple crop trees on the northern half of the land are of exceptional quality with vibrant crowns and large diameters.